To empower Kitsap County residents with the financial skills and information need to increase their confidence, enable them to make sound decisions, and to be better prepared to meet their financial goals. Are you swamped with debt? Are you concerned about your family’s financial stability? Would you like to own a home one day or have the funds to attend college? If so, KCR’s Financial Education Program and Asset Building Coalition is here to help you. 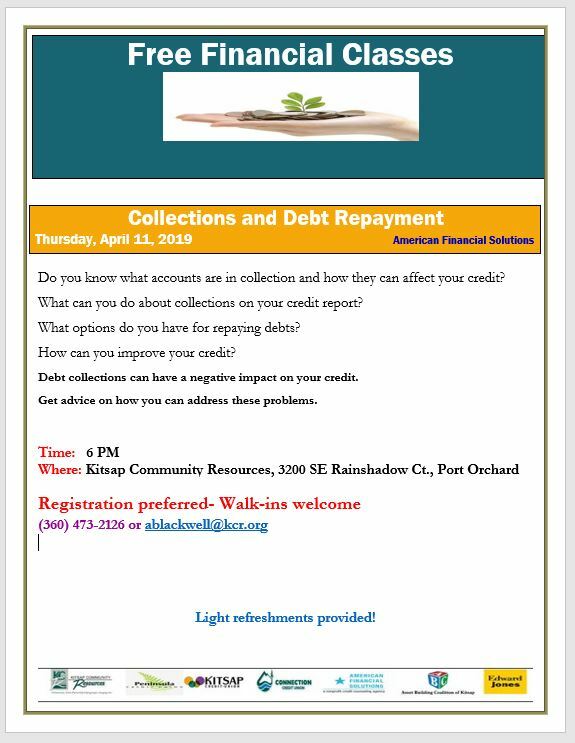 KCR in partnership with the Asset Building Coalition of Kitsap County presents a wide-range of financial literacy classes that can help you set and reach your goals for a more financially sound future. Classes are free and instructors represent Kitsap County financial community partners who are committed to helping you gain financial skills and understanding.